Also serving communities of Fort Calhoun. There are 31 Assisted Living Facilities in the Omaha area, with 26 in Omaha and 5 nearby. The average cost of assisted living in Omaha is $3,665 per month. This is higher than the national median of $3,346. To help you with your search, browse the 199 reviews below for assisted living facilities in Omaha. On average, consumers rate assisted living in Omaha 4.0 out of 5 stars. Better rated regions include Council Bluffs with an average rating of 4.6 out of 5 stars. Caring.com has helped 19 families in Omaha find high-quality senior care. To speak with one of our Family Advisors about assisted living options and costs in Omaha, call (855) 863-8283. Omaha, Nebraska, is at the forefront of fresh dining and the farm-to-fork movement, making it an ideal location for seniors and people of all ages who prefer wholesome foods. There are more than 46,000 seniors in the city, some of whom may benefit from living in an assisted living environment. To support these seniors, there are 26 assisted living facilities in the city, with another five nearby in neighboring communities. 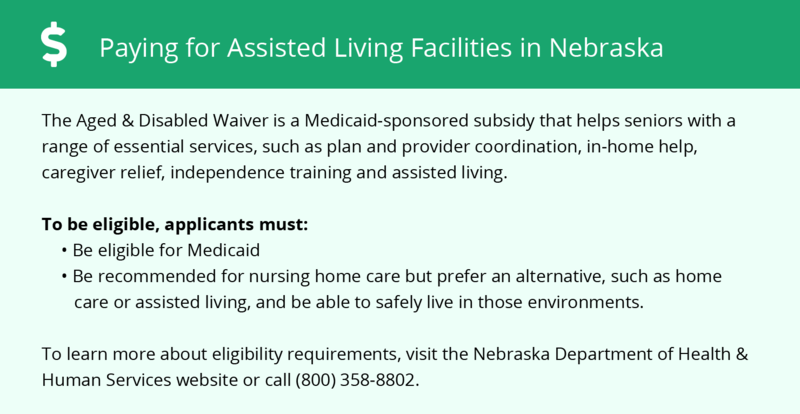 In Omaha, as well as the rest of Nebraska, Assisted living facilities (ALFs) are licensed by the Nebraska Division of Public Health, Department of Health and Human Services, Department of Licensure and Regulation. Nebraska partially taxes social security income, but fully taxes retirement savings account withdrawals and pensions. Seniors living in Omaha might find that the state's tax laws result in less money to allocate toward facility expenses. The cost of living in Omaha is 94.9, slightly lower than the U.S. average of 100, which might be good news for seniors hoping to move to a facility in the area. Medicaid-based transportation is available to help seniors get around the city. It's a curb-to-curb service that can help with getting to appointments and running errands. Omaha has a violent crime rate of 33.9 and a property crime rate of 56.6, both higher than the national averages of 22.7 and 35.4. Although these crime rates are high, seniors in care are protected by security systems, alarms and cameras. Omaha weather is wet with rainfalls of 32 inches per year and annual snowfalls of 30 inches. Families might want to ask facility staff about safety measures in place to protect seniors from the elements in harsh weather conditions. Omaha has good air quality. On a scale where 100 represents the areas with the cleanest air, Omaha ranks in at 62, slightly higher than the U.S. average of 58. Seniors with respiratory conditions like asthma, COPD and lung cancer might be able to breathe easily in Omaha. Assisted Living costs in Omaha start around $3,665 per month on average, while the nationwide average cost of assisted living is $4,000 per month, according to the latest figures from Genworth’s Cost of Care Survey. It’s important to note that assisted living rates in Omaha and the surrounding suburbs can vary widely based on factors such as location, the level of care needed, apartment size and the types of amenities offered at each community. While Nebraska's financial assistance is limited to standard Medicare programs like SSDI and Medicare part D, the Nebraska Senior Health Insurance Information Program has been established to help seniors and people who need health insurance to understand the funding options that are available through Medicare. 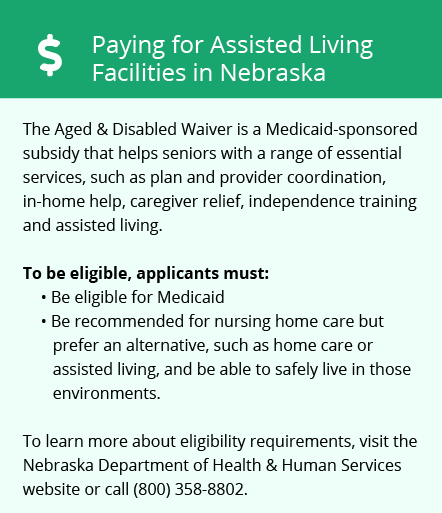 Learn more about these programs, plus who’s eligible, on our Assisted Living in Nebraska page. For more information about different ways to finance assisted living, visit our Assisted Living in Nebraska page. Omaha and the surrounding area are home to numerous government agencies and non-profit organizations offering help for seniors searching for or currently residing in an assisted living community. These organizations can also provide assistance in a number of other eldercare services such as geriatric care management, elder law advice, estate planning, finding home care and health and wellness programs. To see a list of free assisted living resources in Omaha, please visit our Assisted Living in Nebraska page. Omaha-area assisted living communities must adhere to the comprehensive set of state laws and regulations that all assisted living communities in Nebraska are required to follow. Visit our Assisted Living in Nebraska page for more information about these laws.